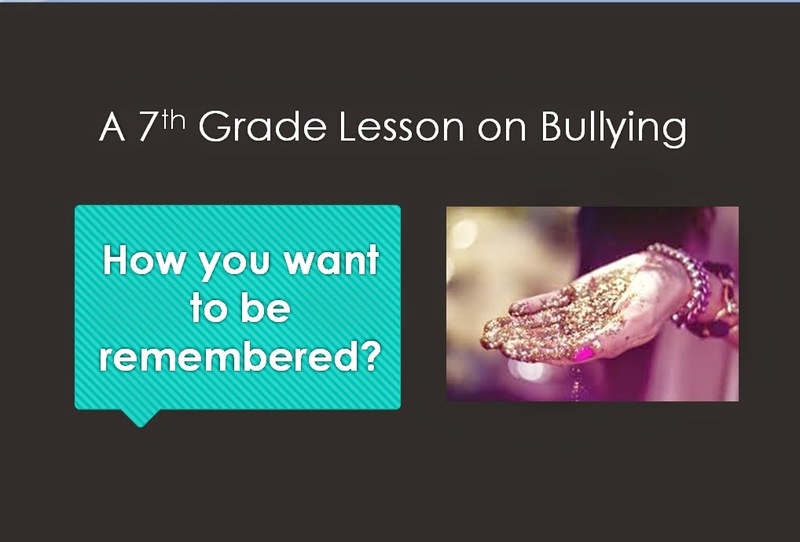 Here is the PowerPoint I showed the 7th grade classes today. I turned it into a movie using Microsoft Movie Maker. While I wasn't able to share everything I talked about with the students into this movie, it does give a quick rundown of what we covered today in class. We did talk about Derek Jeter versus Parker Rice. The actions and words we use can leave a lasting impression for years to come. It brings us back to "How do you want to be remembered." Words can be damaging or "wrap around us like a warm blanket." The videos I showed today packed a punch. One boy told me, "this is the most depressing class of the year." "Maybe," I responded, "because it's the one that hits closest to home. We live this." After the presentation, I asked them to share their thoughts. I then gave them all a challenge. I had the classes break up into 3 groups, and I asked the groups to stand in a line. I told them I would give their class a pizza party if any of the lines could pass a handful of glitter from the first person to the last person without spilling any on the floor or without any sticking to their hands. Needless to say, all were excited to win. Passing glitter is harder than they all thought. It stuck everywhere. Not one single person could get 100% of it off their hands. How is glitter like our words? You can try to brush them off, but they are still there. There is always a reminder. Once it comes out of the bottle (or your mouth), you can't put them all back in. They can stick to everyone and everything. It's impossible to get rid of what you said once someone has heard it. I'll be back in class tomorrow. I can't wait to talk them some more about bullying. I also want to thank Keryn and Carey for sharing with me their presentations that they put together. That's the power of collaboration and teamwork you can find in the Caught In The Middle School Counselors FB group. Want to join? Click on the links below. I love this presentation! When viewing it, the videos do not display. Could you give me a link to your videos? Thanks. Goodness, the way you ended the presentation is deeply moving. I was moved. I can't get the videos to play....could you send me the links? thanks! this is so great! Thank you SO much for this lesson Carol!!! I was able to do it with my 7th and 8th graders today & it went SO well!! You are so amazingly talented!! Thank you for sharing your talents with us! did anyone get the links to the movies? I would like to use this next week. Thanks. I would LOVE the link to this video....could anyone forward it to me ?